Or view larger version. 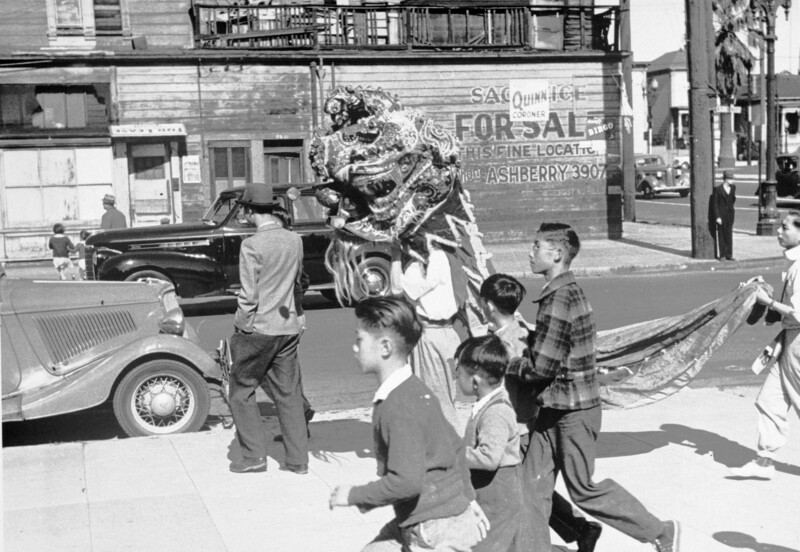 Young Chinese boys runs alongside a dragon in San Francisco's Chinatown parade along Sixth Street. ca. 1936. William Simpson, photographer. Gelatin silver print. Collection of Oakland Museum of California. Gift of Anita Simpson. In this photograph, young boys run alongside a Chinese lion dance team while onlookers watch from across the street. If not for the 1930s automobiles, this photograph could have been taken yesterday in any Chinatown or Chinese community in the United States, where lion dances performed to ward off evil spirits are not an uncommon sight. This photograph, however, was taken around 1936 on San Francisco's Sixth Street, not in its famous Chinatown, at a time when such a sight would have been less common.